Kitten, in the thick of things as usual. I read an interesting article in the NY Times the other week, on making homemade food for your pets. Have you seen it? The article describes the latest trend in making food for one’s domestic companions, rather than serving them kibble and mystery meat from a can. At first the trend, represented by overly conscious New Yorkers, reminded me of the scene in Best In Show where the gay couple goes to the butcher’s to buy fresh meat for their two pampered lap/show dogs. I remember discovering, when I first came to France, that my host mother made food every morning and every evening for her two old and rather ill-mannered toy poodles. She combined cooked hamburger patties with noodles or rice, then topped it with veggies, leftovers and something that I suspect was brewer’s yeast. Sometimes, but not often, she added a bit of kibble. I remember being impressed that she went to so much trouble to prepare food for her dogs, but they each lived to a ripe old age (late teens, early twenties, if I remember correctly). Then I became the person to my own aged (and crotchety) animal. 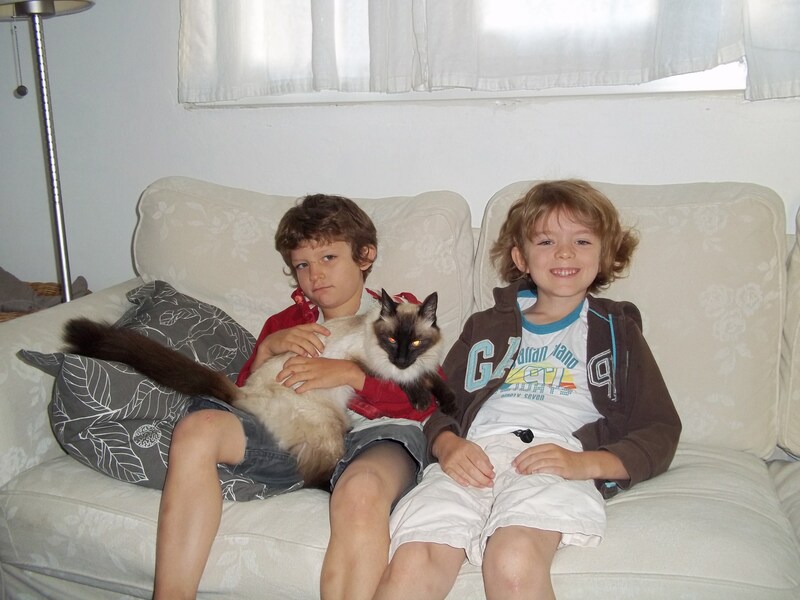 When I moved to France I brought my two cats along with me. The mom cat, my cat, died a year and a half ago at the age of 16 but her daughter is alive and kicking, albeit skinny, at the age of 16 and 1/2. It’s the skinny part that gets me. She has a hard time eating- if she eats too much she throws up, if she doesn’t eat often enough, she throws up. She has a hard time eating kibble because it hurts her mouth, but she doesn’t like it when the can food sits out too long. So I’ve started cooking for her- not as her entire diet, but as a complement, so that she’ll at least eat something. She also lurks under the table and eats the kids’ table scraps, like a dog. (This whole problem is compounded by the fact that she’s part Siamese and when hungry, capable of waking me up at 5 am in the way that Siamese cats do best to tell me so.) I never thought that I’d cook for my cat…but then again: the things we do for our beasts. I was hoping you’d tell us exactly what you cook for your cat. Do you have a special recipe? I started feeding my cats homemade cat food last summer. One cat has special dietary needs and it was cheaper to make it rather than buying the appropriate canned food, especially as both cats always eat each other’s food. (I found my recipe in a book, “Veterinarians’ Guide to Natural Remedies for Cats” and ran it by my vet, too.) Good luck with your skinny kitty! I just want to mention that when making homemade food for cats, they absolutely require a certain amount of taurine to live, literally. (They will go blind and their health will deteriorate without it.) They also need other vitamins added to their food, and lots of protein. Obviously this is more important if you are feeding them solely homemade food and not supplementing with commercial cat food. You can find some good recipes online or at the library. Stick to ones created by veterinarians. Actually, I just made some homemade dog biscuits and am quite happy with the results, as are my three rottie mix dogs. I don’t have time to make all their food or I would. When one of them is sick, I make a ground beef, rice mix thing which they love. Since they are my family, I’m happy to cook for them. Well since no recipe here guess I take off you are to young to know this type of things but cats can eat fish just needs to be cooked just like for dogs is no fish but they can have cooked chicken with rice and carrots in it nothing ellse you also donnot need to add spice or salts or pepper thats for human comsumption so learn on e-vet.com its not hard to put two and two together. Next post: Let’s Get Social!